Following on from T's 3 1/2 year 'birthday' party last week, here are some top tips for throwing a birthday bash. 1. Have thank you cards ready before the big day, you really won't be bothered afterwards! 2. Don't bother with games or an 'entertainer' for under 5's, all they want to do is dance, run about or play on a bouncy castle. 3. Have a refreshments station for parents, let them make their own coffee and tea! 4. Whilst we are talking about refreshments, use sugar cubes to minimise mess! 5. Don't forget a sharp knife, sellotape, scissors and a pen. 6. 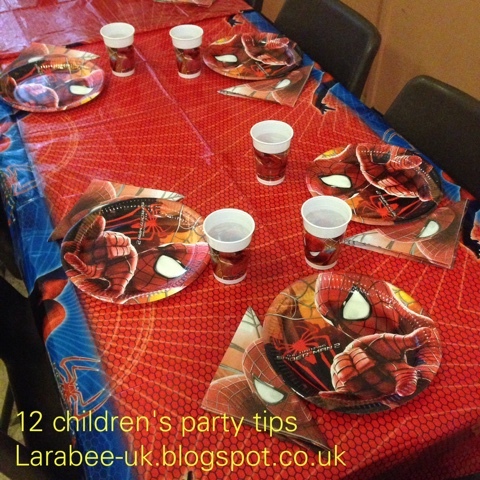 Do use disposable partywear and platters where possible. 7. Don't waste your time on helium balloons for the children, they are perfectly happy with normal ones to kick about/burst! 8. However much food you think you'll need, double it for the parents (they are like ganets!!!) I totally didn't cater for parents because as far as I was concerned it was a kids party. After the kids had eaten they cleared everything in under 5 mins! 9. And on that note, however many cocktail sausages you think you'll need quadruple it, kids love cocktail sausages - fact! 10. If you invite children to dress up, make sure you take a spare costume yourself, I guarantee you'll need it and it saves tears. 12. If you're planning on doing an early shop, check what time they open, I nearly got caught out by this, planning to arrive at Iceland for 8 but was running late, it doesn't open until 8.30! The partywear in the photo is from Party Pieces see all the details in this blog post of T's actual birthday party here I also have a post on party planning here.